Jumping into a capsule wardrobe head first can be pretty daunting. In fact, for some people there’s so much self-imposed pressure to get it “right” that it keeps them from even trying. Let’s set aside the idea of a full seasonal capsule and focus instead of testing the waters with a mini-capsule: 12 pieces, 3 colors, so many possibilities! This sample wardrobe is as minimal as it gets. The palette is neutral and the pieces are the kind of basics you see in so many capsule wardrobe examples, so why are we showing them again here? Starting simple is often the best way to internalize an idea before adding individual style to the mix. The intent is not to encourage everyone to dress the same! That said, if you have these items in your closet they will serve you for years and will easily mix and match with the other items in your closet. Dip your toe into the capsule wardrobe water! Putting together a 12-item mini capsule wardrobe is a great way to test out using a capsule wardrobe. Create your own by choosing three colors in your closet and adding in the number of pieces mentioned above. Don't worry if you only have ten pieces in those three colors or you need to throw in a printed item. Make it yours! The goal is to get a great sense of how many outfits can be made with just 12 coordinating items. As you can see from the thumbnails below, these 12 pieces combine for a lot of outfits! Click on each thumbnail to see a larger image and to read more guidance. We're brewing up something new based on the 12 Item capsule wardrobe. Look at this beautiful example in Navy, Cream & Camel. 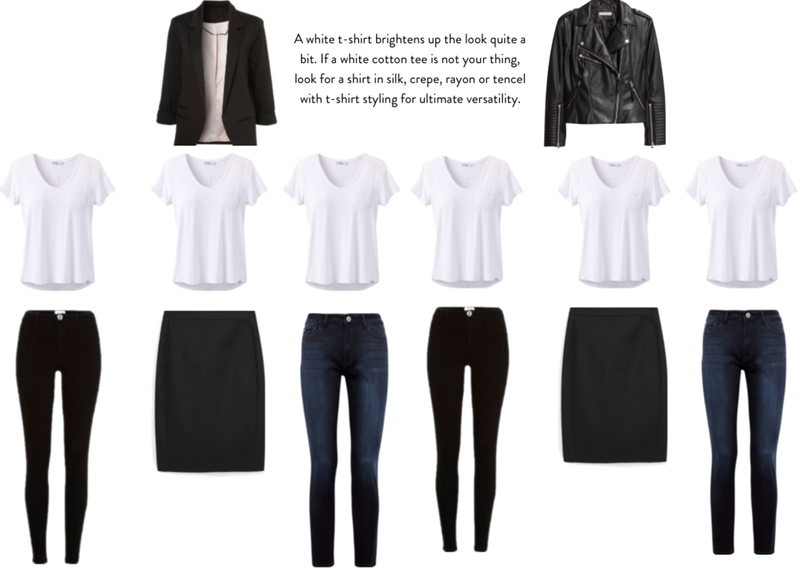 Do you have a minimal capsule of basics?